The Revised Draft of the MLA Forums is now up and open to comments. You’ll see that, as a result of all the 18c MLA membership’s militating against the earlier draft’s proposed changes the forums are now left intact in this version. Please visit the latest version online, and register your appreciation of their change of heart. For those attending, you should be aware that there will be an open hearing on the proposal on Thursday, 5:15-6:30 (Chicago VI, Sheraton Chicago), and it would be extremely useful for 18c reps to be there in person to hear the incoming and outgoing MLA presidents (Marianne Hirsch and Margaret Ferguson) explanations of the reorganization process. There will also be opportunities for further comment at the Open Hearing of the Delegate Assembly, and the meeting of the Delegate Assembly (limited opportunity for member comments). Please make every effort to attend. 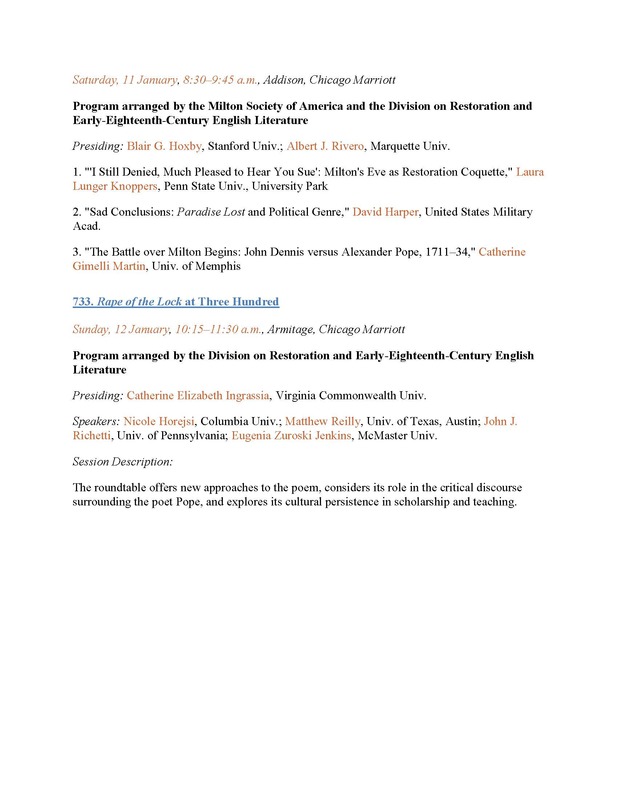 As I’ve already suggested on the blog, the Restoration and early 18thc English and Late-18th-c Groups have some great panels this week, so please turn up at the sessions and support your fellow presenters. I suspect attendance will be closely watched by the MLA as they continue to discuss the reorganization. 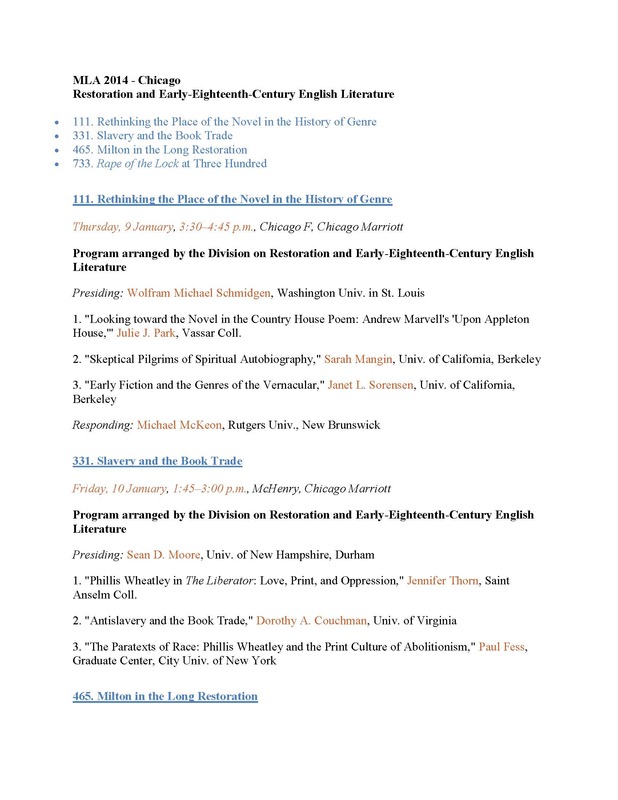 Sean Moore reminded us on C18L that there will be a Cash Bar for 18c folks Saturday, January 11, 7:00-8:15 p.m. in the State room of the Chicago Marriott. As always, at the Long 18th, we’re always happy to hear about any news or thoughts about the matters discussed in or out of the panels at MLA. Hit Reply if you want to pass along some bit of news. And now for the later 18c. 113. Have We Ever Been Secular? Speakers: Amanda Jo Goldstein, Cornell Univ. ; Heather Keenleyside, Univ. of Chicago; Catherine Packham, Univ. of Sussex;Andrew Piper, McGill Univ. “Until the end of the eighteenth century . . . life does not exist: only living beings.” Our two divisions will revisit Foucault’s still influential, periodizing thesis to question its validity in the light of recent work in the field and to think about what we do and do not share. In the wake of the 250th anniversary of the Seven Years’ War, considered by many as the first worldwide war, we would like to open a discussion of war and literature. On both the continent of North America and the Indian subcontinent, war for empire among the European nations swept away first nations, redrew boundaries, and inflected communal identities. In light of earlier posts urging continued representation of all three sub-periods in our 18c MLA sessions, I would urge any ASECS members attending MLA this year to attend as many sessions as possible and show your support.